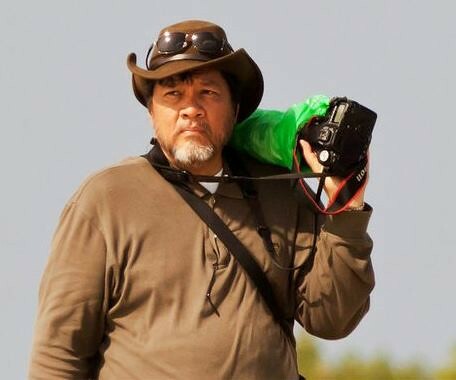 It started with an ordinary story of Sir John Chua who one day came across with Ian. 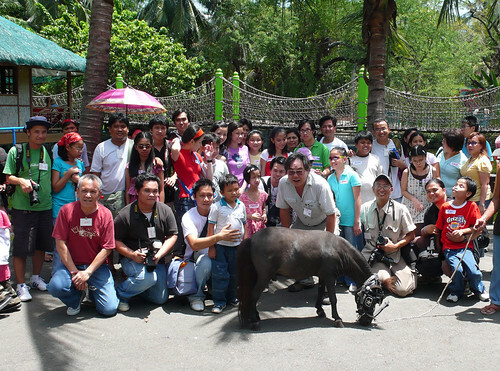 Now, that story made a great impact on Ian’s family and everyone who heard that story were touched including why this morning's event at Manila Zoo took place, "A Special Day for Special Children" click this for more details. and to everyone who have participated in their own little ways. "Blessed are you who spend time and effort with me, for you make my world colorful." To all who participated this morning's event... tell us your stories plus the special moments that you've captured with these special children. This is such a nice activity, so selfless, so much sharing, and making children so happy. 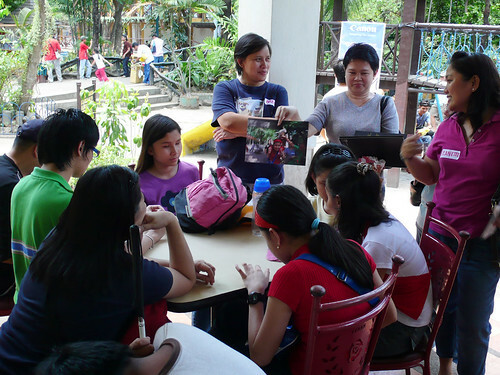 I hope this continues so that we can reach out and touch the lives of children who have disabilities. These small things definitely means a lot to them. Wow. This is a testament that photography isn't just for those who can see but for everyone who has a heart. For the organizers and individuals who selflessly shared their talents, time, love and care, you just keep our world more colorful and meaningful to live. God Bless you all! I can't wait to see those big smiles! This was taken when the Wire agencies requested a group photo. Some of the pipho photographers had left already. The Blind can See while Kathy was letting this girl touch the horse. Remember Ian. He was there with his parent. He was shooting every kids. 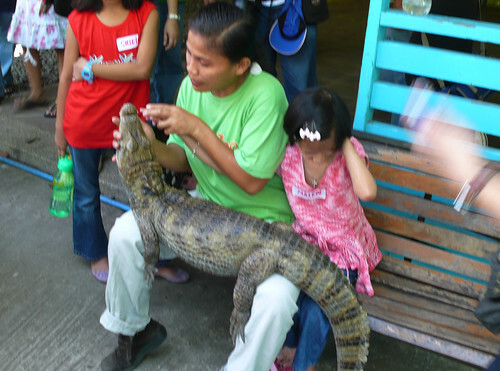 Kiddie Zoo volunteer explaining to the child about Crocs. Sorry, I miss out a lot of opportunities to shoot. I am sure the 15 photographers will have more than enough to fill your hearts. This is a testament that photography isn't just for those who can see but for everyone who has a heart. 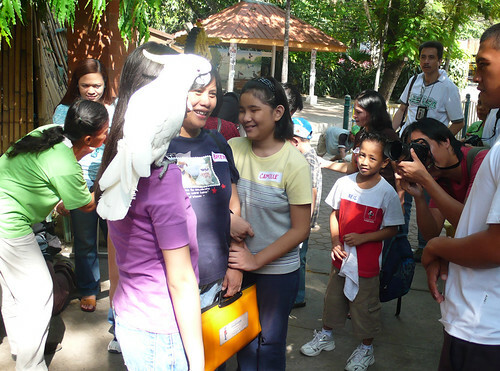 What we got from Manila Zoo shooting ? Came there very early, about 7:15am. Nice to see the parking lot basically empty. We were short with photograhers, so much so I was made to take 2 children. By the end of the day, however, I had 4. Or maybe it was 5 because I have 5 people I shot quite a bit. We were supposed to have 15 children only, but we had 3 more extra and we were about 2 photographers short. Oh, well, like we always do in events, we make do with what we are given. It's just that I knew that my shots will be more like snapshots instead of really having time to compose or to explore angles, what with having 2 children to look after (this is at the start, later I was shooting 2-3 more). I was originally paired with JC. But I got another child due to lack of photographers. The other child is Keana. Here is Keana with her mother, and her sister. The first order of the photo op was with the small horse. The children were eager, curious, and in the beginning even fearful of the animal. Mind you, if you have been blind all your life, you don't have a cognitive map or image of what a horse is, then you would have apprehensions too! . Compound it with the smell of the animal (their other senses are more used and they notice these things quickly). Keana was less fearful. More curious really. She rubbed and touched that horse from head to the behind! Kathy tried to make JC comfortable. But I think JC was trying to build a cognitive image based on touch and was not ready to ride the horse. JC did work that horse from head to the behind! 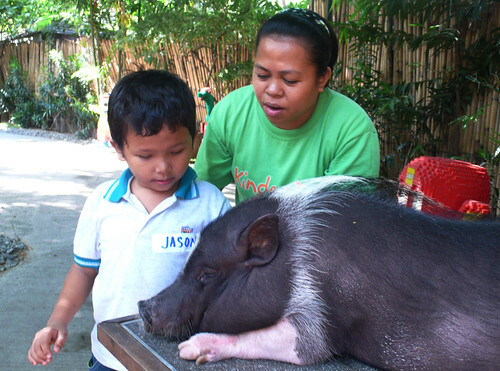 After the horse, we when to the children's zoo to meet the other animals. The first to greet us where the birds! JC seemed to enjoy the birds better. The soft and smooth feathers are sure more appealing! The pig was docile. In fact, he may been so used to this as he did play his part well! Didn't squeel or tried to get away! They did find the turtle a curiosity. JC even rode this one! JC loved the reptiles though! He even spent a long time with the crocodile and counted its fingers! But JCs favorite was this yellow constrictor! Keana seems to be enjoying it too! The next was with Mali, the elephant. JC lagged behind and they didn't join the group. A pity I wasn't able to have my picture taken with JC. But I had one taken with Keana. Just so that my YL/GF sees this post, it's not what you think! For the curious on the technical and equipment selection, I decided to use the tamron 17-50 f2.8 di and the 55-250 IS for the long shots. But in effect, the 10-22 and the 17-50 were the most useful. I already know how the 10-22 and the 24-105L would have worked just as well, I wanted the 17-50 to take the lead for the f2.8 when at times at the shaded area, the light can drop even so low even if we were outside with a 10-11am sun. In fact, I had to fire my flash and finally decided to mount my 430 ex later on. The elephant shots were such examples. I will create another post on the other pictures in that album. Thank you for viewing. My apologies for my less than stellar shots. Great set and great writing Mel. saw your pics, you did have your hands full! Nice shoots! 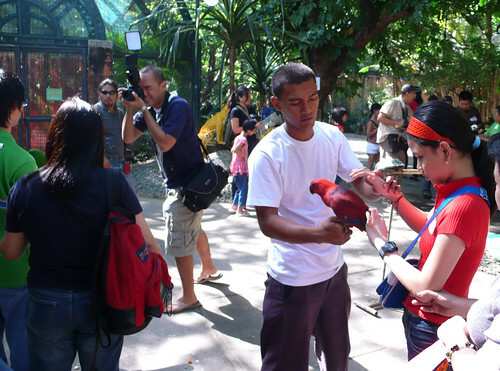 You know this morning many of our parents at the zoo met when we sent our children to a summer camp, they were all smiles talking about the photos they got home with, ang galing ang shots daw! Thank you pipho guys for all your nice photos, if you can give us your pics of our children in CD, it will be much appreciated . I can either get the contact no. of the parents or you may also send thru me. Again, thank you very much guys! Re: Mel and Orlee ...Great Shots!!!!! Great Beer ?????? 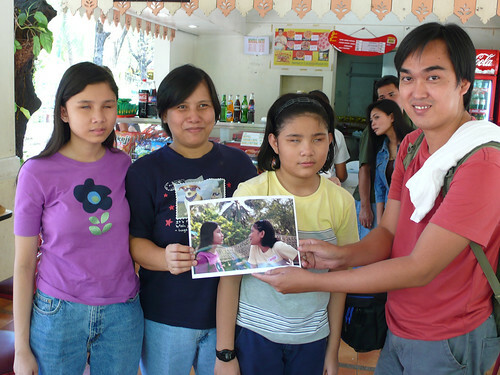 Caterpilar (Sir Mel), thanks for the wonderful moments you've shared in your "My zoo photo essay". I hope all the photographers who are present in the event will share this photos too. Watch this very brave kid Enrique while sliding. Jason while riding a a two-toed bird with a long bare neck and small head Ostrich. 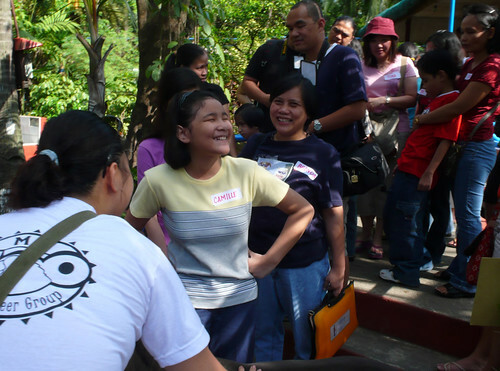 Little Yna while feeling the thick-skinned crocodile body. His positive outlook in life is so contagious.. Ian's mother was requesting his contact number because she would like to take him on their helicopter ride one time. I would like to treat Jason to ride with me on a motorcycle to go to Star City and enjoy ALL the rides. 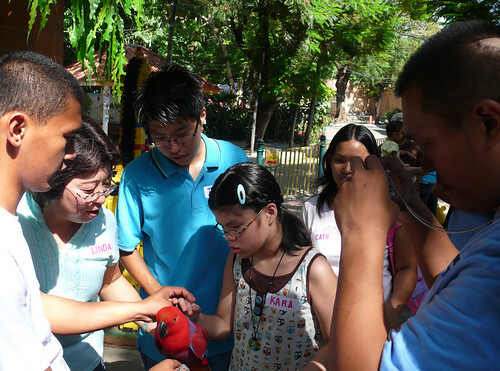 Christine's eagerness to know about the small horse and get information. 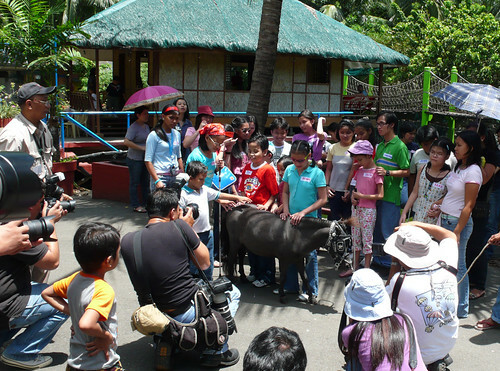 JC while waiting his turn to meet the small horse. After waiting for a while, it's JCs turn now to touch and feel the small horse. A big NO NO for JC as he refused them (including Ian) while they convinced him to try riding the small horse. Page created in 2.387 seconds with 53 queries.